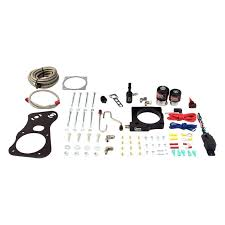 Nitrous Outlet Mopar Hemi 90mm TBS No Bottle System 400 HP Nitrous Outlet Mopar Hemi 90MM TBS No Bottle System 400 HP, Nitrous Outlet 00-10133-00 Dodge Kit, Nitrous Outlet No Bottle System, Nitrous Outlet Dodge Hemi TBS System, Nitrous Outlet Dodge Hemi TBS No Bottle System, Nitrous Outlet Dodge Hemi System [Nitrous Outlet 00-10133-00 Kit] - $700.00 : 3rd Strike Performance, Your Source for Late Model MOPAR Performance Parts and Accessories! Nitrous Outlet nitrous oxide plate systems come out of the box ready to deliver superior atomization. They spray up to 200 hp, but are capable of flowing up to 400 hp with additional jetting and a -6 AN main feed line upgrade. You'll get race-proven performance from the unique 6-port discharge design, guaranteeing the perfect mixture of fuel to nitrous.